The Dazz Band grew out of the Cleveland jazz fusion band Bell Telefunk. Originally consisting of Mike Calhoun, Kenny Pettus, Bobby Harris, Ike Wiley and Michael Wiley, they recruited extra members Kevin Kendrick, Steve Cox, Eric Fearman, Pierre DeMudd, Sennie "Skip" Martin, Jerry Bell and Terry Stanton. Their debut hit in America was 'Shake it up' in 1980. 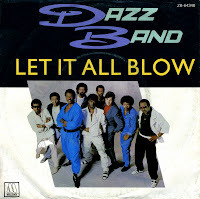 'Let it all blow' was released in 1984, like their former albums and singles on the Motown label. It became their biggest hit in the UK, peaking at number 12, and their only hit in the Netherlands, peaking at number 10.